I went with a few friends to a Mongolian restaurant a few weeks ago. I abandoned the vegetarian train for sone delicious lamb. We ate in our own yurt style room. Not over the top, it was the usual gimmicky thing you'd find in Taiwan but I had a great time. Afterwards we headed to a beer house, well a place that sold terrible beer but the company was agreeable. 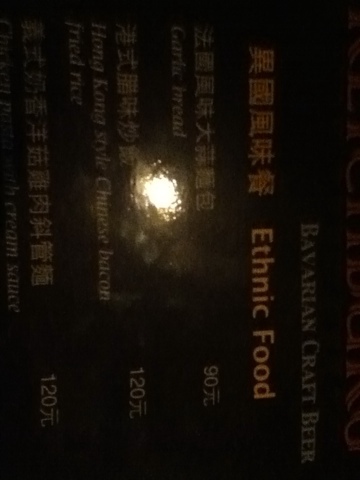 In their food menu they had an ethnic food section, I was particularly entertained by garlic bread being listed as one of the options. Hahahahaha.